When people in the automotive and car business decide to create website, they know this site should feature special kind of layouts and certain options necessary for their company to function properly online. Recognizing the right theme for your website is crucial, because the right theme has all the important qualities wrapped up and packed into a perfect product for your needs. 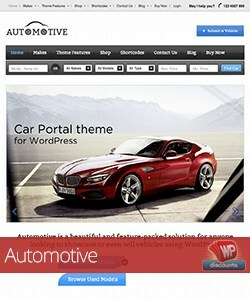 I’ve prepared a collection of automotive and car WordPress themes aimed at various businesses related to the niche. This includes not only car dealers, but also automotive magazines, vehicle marketplaces, blogs, car rentals, etc. With these themes, creating and maintaining your website comes down to simple installations, allowing you to run your business properly even if you aren’t a skilled coder. 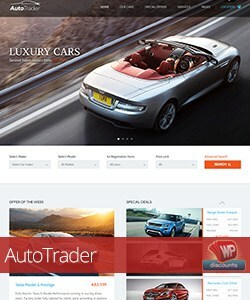 The AutoTrader theme from Themefuse is a gorgeous WordPress theme and one of the best automotive themes we’ve came across, suitable for online car marketplaces, automotive magazines and blogs. The theme is packed with all the crucial features needed for such a website, such as suitable pages and options, splendid search fields and many filters you can setup to have your website function better than you’ve even imagined. The responsive layout guarantees your website is going to look great on all devices. Listing features a responsive design suitable for any device. It is perfect for car dealers as it allows you to display unlimited attributes for each listing like location, color, fuel type, all of them being user generated so you can choose which to create and add to private listings. Navigation comes with a featured listings slider, featured listings grid, a custom made search form and you can even add a map where you can mark each listing by address and location. A form builder lets you create custom search forms and contact forms. 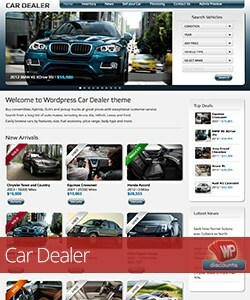 The AutoMotive theme was created for car dealerships by Gorilla Themes. It features a responsive layout, Craigslist integration, batch XML and CSV importing of vehicle listings, VIN Decoder and many more handy options. Adding listings to your directory is very easy with the VIN Decoder, all you need to do is add your vehicle VIN number and all the data will pre-fill the listing information right away. A full blog module is integrated and you can allow your customers to add their own vehicles for appraisal, which you can integrate in the inventory, approve or delete it as you please. Another theme called Automotive, this one is created by Templatic makes a fine choice for anyone who wants to start a car portal. A front end submission form is included so you can choose whether you want the directory to be user driven or you want to manage it all by yourself. Your car classifieds website can be up and running in no time and you can even use it as a proper web store because it is compatible with the WooCommerce plugin. 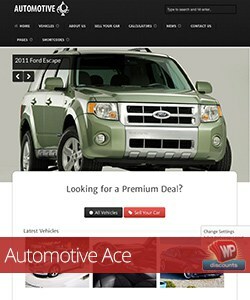 The Automotive Ace theme is a responsive car dealership theme featured at Mojo-Themes with many animations, page and post transitions, sliders and carousels. Everything is loaded through Ajax. There are 12 transition animations available or you can choose a random animation as well. 361 various icons are featured for loading images and many different homepage designs you can choose from. You can also change the fields at any time and select from various settings. With tons of shortcodes, a powerful admin panel, quick setup time and numerous variations for creating a unique website, Automotive Ace justifies the “Ace” in its name. 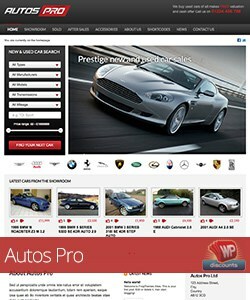 The Autos Pro theme features an attractive homepage and many custom page templates suitable for a wide range of uses. You can showcase your vehicle collection in a showroom and allow your visitors to choose views (grid or list). 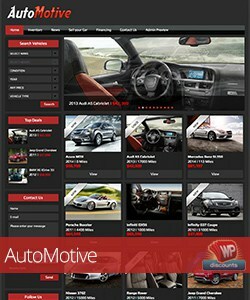 Each vehicle is displayed on a separate page with an image gallery and info. Vehicle search is also included and it is fully customizable so you can add or remove fields easily. WordPress’s custom menus are supported with a possibility of adding and editing many areas. 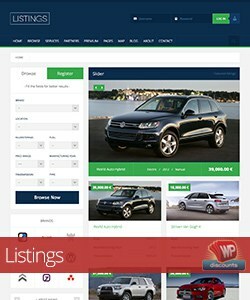 The Car Dealer theme from Gorilla Themes is aimed at dealerships with Craigslist integration. This is a theme with a responsive layout that is going to look perfect on every device. VIN number decoder is included, the easiest possible way of adding listings to your directory. Vehicle details and specifications with a financing calculator and contact form are featured and they can be activated on any page. You can add videos to your listings, and with a blog module included you can post as much as you want. You can also choose whether you want your visitors to add their own vehicles to your website or you can choose it to be run by you (the admin) only. 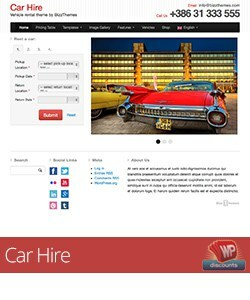 BizzThemes’ Car Hire theme has an integrated booking system created for rent-a-car agencies. You can take reservations and manage them right there on your website. Managing multiple office locations is also possible, as well as easily categorizing cars and creating groups of different car types. Your customers will automatically be emailed and informed about their booking and you don’t have to worry about double bookings because a booked car doesn’t appear as available on already booked dates. 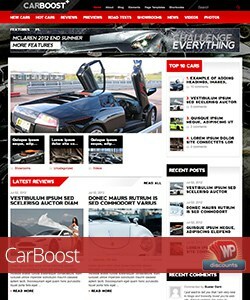 WPDance’s CarBoost was created for car review magazines. A slideshow for the hottest info is added to the top of the homepage, and the sidebars are reserved for the top 10 cars of your choice as well as various featured articles and posts. You can feature various reviews, recent posts and latest posts on the homepage as well and all of your content can be placed in a wide range of categories for easy navigation. 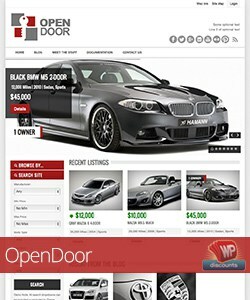 OpenDoor is a responsive automotive theme bundle with lots of great features. It can be used for real estate as well, as you get to choose which one of these two theme options you want to use. With VIN detail output included (optional), you can have your listings auto filled quickly and easily. Many parameters are included for the search form and you can easily include or exclude each one of them. Listings can be browsed by desired values, such as manufacturer, body type, model year, engine size, etc. Each listing page contains a contact form. 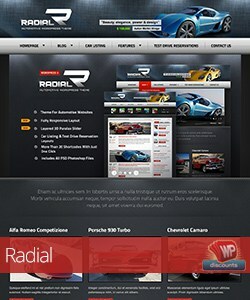 Radial features a car listing design with multiple page support and a table reservation system. A powerful admin panel is included, allowing you to customize the theme easily. The theme design and all its elements are perfect for car related businesses, and as for the listings themselves, they are easily manageable. You can add photos, description, tech information and price for each vehicle. Many unique shortcodes are featured, and a lovely looking gallery. 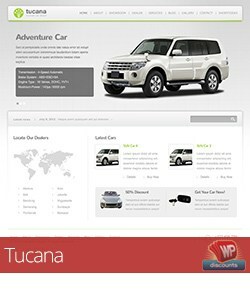 The Tucana featured at Themeforest comes with two homepage options, a clean and elegant design and powerful admin theme options. It features custom post type for slideshows, custom page templates and portfolio page templates with categories and lightbox support for images and videos. 7 custom widgets are included and a built in Ajax contact form. 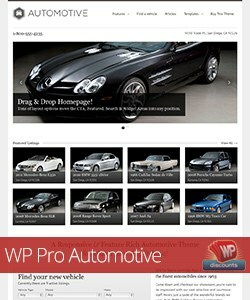 WP Pro Automotive is a powerful car dealership theme for showcasing your listings. Unlimited skins and patterns are featured and it comes with 5 custom page templates. Custom built list mapping is included and 17 custom widgets such as: Asspace, Agend info, Agent other listings, Broker info, etc. With a child theme creator included, you can create a child theme in no time and a QR code is included for quick checking out via mobile devices. Start off your website as a professional, choose only the best for your business and you will be rewarded with new customers. Investing in a quality theme is always a good move! I found the best for me: AutoTrader. Thanks for the list.